She made her remarks shortly before a Muslim Democrat from Philadelphia was sworn in after winning a special election. Democratic Leader Frank Dermody called Borowicz’s invocation “beneath the dignity of this House” and asked that a group be set up to review the procedure. Borowicz represents a Clinton County district and insists she did nothing wrong. Republican House Speaker Mike Turzai is currently appealing a federal judge’s decision that stopped his policy of preventing nonbelievers from giving the invocations. PITTSBURGH (AP) — The foreman of a jury that acquitted a white Pennsylvania police officer of homicide says Michael Rosfeld didn’t know the black teen he shot was unarmed as he ran after his vehicle was pulled over. Juror Jesse Rawls Sr. told WHTM-TV that Antwon Rose II and another occupant who ran from the stop “brought it on themselves” and that the then-East Pittsburgh officer knew there had just been a drive-by shooting and was scared. Rawls, who is black, is a 72-year-old retired schoolteacher and wrestling coach from Harrisburg, where jurors were picked for last week’s trial in Pittsburgh. He says jurors “did what was right” in acquitting Rosfeld of all charges Friday. Hundreds of high school and college students are protesting the verdict Monday in downtown Pittsburgh. PHILDADELPHIA, Pa. (AP) — The Pennsylvania attorney general’s office is charging a co-founder and former executives of an addiction treatment firm and accusing them of profiting off addicts by fraudulently billing insurance companies for tens of millions of dollars. Attorney General Josh Shapiro announced the charges Monday against 11 people and nine corporations. The case revolves around Liberation Way, a for-profit treatment company with centers in suburban Philadelphia that was sold to a private equity firm in 2017. Those alleged schemes include billing for substandard, nonexistent or unnecessary treatment. Shapiro also says the company got kickbacks from insurance coverage of unnecessary urine lab tests and warehoused addicts in poorly run, unlicensed facilities. Donald Trump Jr. gloated over the arrest on Twitter. “Good news for my friend @MichaelAvenatti, if you plead fast enough, you might just get to share a cell with Michael Cohen!” he wrote, referring to the former Trump lawyer set to go to prison next month for crimes including orchestrating hush-money payments to Daniels. Avenatti allegedly threatened to hold a news conference last week on the eve of Nike’s quarterly earnings call and the start of the NCAA tournament to announce allegations of misconduct by Nike employees. The attorney and a co-conspirator demanded to be paid $15 million to $25 million and an additional $1.5 million for an Avenatti client to remain silent, the complaint said. TALLAHASSEE, Fla. (AP) — Karen Leicht is a convicted felon from Miami and a self-described “cat lady” who wants to vote. Although Florida voters overwhelmingly approved a constitutional amendment to restore voting rights for most felons, she told a Senate committee Monday that she hasn’t registered because she wasn’t sure if she was eligible: She completed a 30-month prison sentence and three months’ probation for a conviction of insurance fraud she said she was unwittingly caught up in. WINSTON-SALEM, N.C. (AP) — Public health officials in North Carolina say the sudden onslaught of mass vomiting at an elementary school wasn’t caused by a nefarious disease, but rather fruit-flavored concentrate, spicy food and “sympathetic vomiting.” Citing a Forsyth County Department of Public Health release, news outlets report two dozen fifth-graders and one adult fell ill Wednesday afternoon at Petree Elementary School. PORTLAND, Maine (AP) — Nine nurses who work in the labor and delivery unit at the largest hospital in Maine are expecting babies in the next few months. Maine Medical Center announced the bonanza of babies with a Facebook post on Monday featuring eight of the nine nurses and their respective bumps. The army of infants is expected to arrive between April and July. The Portland hospital’s photo showed the nurses wearing their hospital scrubs and holding cards indicating their due dates. There were pinks and blues among the cards, along with two yellows and a green. The nurses are supporting each other during their pregnancies. WMTW-TV reports they plan to be there for each other’s deliveries. The hospital says all nine of them are registered nurses. 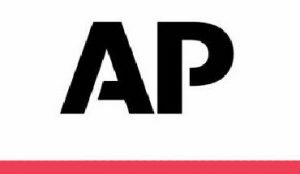 LONDON (AP) — The flight on Monday seemed to go perfectly well, until passengers realized that their plane had landed in both the wrong city and the wrong country. The British Airways flight from London City Airport was supposed to head to Duesseldorf, Germany, but ended up in Edinburgh (EH’-dihn-bur-uh), the capital of Scotland. The airline said Monday the problem started when an incorrect flight plan was filed by WDL Aviation, which operated the flight on behalf of British Airways. Officials say the pilot followed the flight plan for Edinburgh, and that air traffic control officials also were following the same flight plan and saw nothing amiss. WDL aviation said it was trying to determine the cause of the “obviously unfortunate mix-up.” The flight was refueled and set off again, this time directly to Duesseldorf. ORLANDO, Fla. (AP) — Nikola Vucevic had 28 points and 11 rebounds, and the Orlando Magic held the Philadelphia 76ers without a field goal for a stretch of nearly 12 minutes in a 119-98 victory. Evan Fournier scored 24 points for the Magic, who outscored the 76ers 30-5 over a second-half stretch in which Philadelphia missed 15 straight shots. NEW YORK (AP) — Teddy Blueger scored two goals and Matt Murray made 33 saves and the Pittsburgh Penguins surged to a 5-2 win over the New York Rangers. Justin Schultz, Nick Bjugstad and Matt Cullen also scored for Pittsburgh. Phil Kessel and Marcus Pettersson each added two assists. CLEARWATER, Fla. (AP) — Jake Arrieta has no doubt the Philadelphia Phillies will be successful this season. The 33-year old right-hander allowed two runs, six hits and struck out eight in over six innings as the Phillies completed spring training with a 3-2 win over the Tampa Bay Rays. Philadelphia transformed during the offseason, signing right fielder Bryce Harper to a $330 million, 13-year contract after adding left fielder Andrew McCutchen, shortstop Jean Segura and catcher J.T. Realmuto. The Phillies open their season on 1070AM WKOK this Thursday afternoon. Our regular programming continues on WKOK.com. Colorado at Minnesota 2:05 p.m.
Pittsburgh at Houston 2:10 p.m.
Boston at Chi Cubs 3:05 p.m.
Chi White Sox at Arizona 3:40 p.m.
San Diego at Seattle 4:10 p.m.
Milwaukee at Toronto 7:05 p.m.
Oakland at San Francisco 9:45 p.m.
L-A Angels at L-A Dodgers 10:00 p.m.
Detroit at Tampa Bay 12:35 p.m.
Cleveland at Texas 2:05 p.m.
Cincinnati at Atlanta 1:10 p.m.
Boston at Cleveland 7:00 p.m.
San Antonio at Charlotte 7:00 p.m.
Houston at Milwaukee 8:00 p.m.
Atlanta at New Orleans 8:00 p.m.
Detroit at Denver 9:00 p.m.
Washington at L.A. Lakers 10:30 p.m.
N-Y Islanders at Columbus 7:00 p.m.
L.A. Kings at Edmonton 9:00 p.m.
Chicago at Arizona 10:00 p.m.
Anaheim at Vancouver 10:00 p.m.